A hydrogen train that does not produce greenhouse gas emissions is set to be tested in the UK by Vivarail. 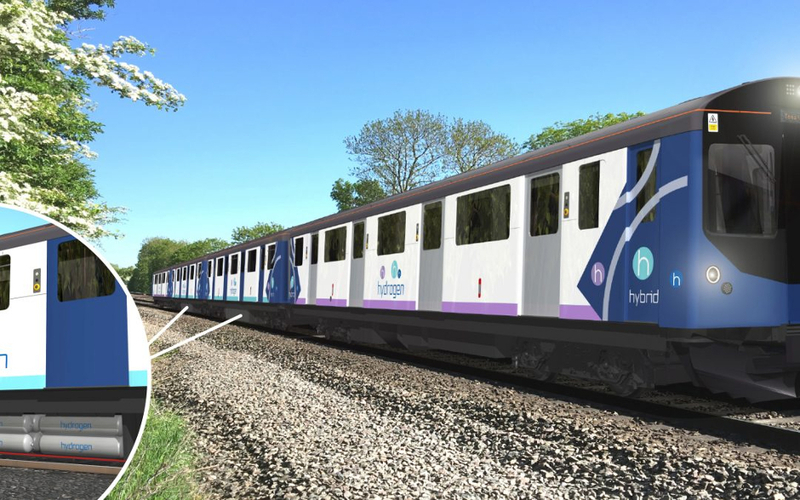 The UK train designer is developing a modular hydrogen train consisting of fuel cells, tanks, and two lithium ion batteries. The test train, which is currently in production, is due to begin operating on the company’s track by the end of 2019, according to Vivarail’s Alice Gillman. “We’re expecting that by the end of the year we’ll be clocking up the miles and gauging its performance,” said Gillman. The train will be made up of two driving motor cars powered by the batteries, developed by German specialist Hoppecke, and two carriages housing the fuel cells and hydrogen tanks. The Vivarail Class 230s will store the fuel cells and tanks in a robust casing beneath the floor, meaning there will be no reduction in space within the carriages for passenger seating. The train, which has a range of 650 miles, also uses regenerative braking to recover energy as it slows. The vehicle’s modular design means trains fitted with diesel generators could ultimately be converted into hydrogen vehicles, said Gillman. The government is aiming to phase out diesel-only trains altogether by 2040. The Department for Transport recently announced £1.75m in funding to be shared between five projects designed to cut the carbon footprint of the UK’s railways. In October 2018 Vivarail also launched a battery-powered train, to carry passengers on the Bo’ness and Kinneil Railway in Scotland. The two-car unit can be split and used to develop and test next generation train designs, with cars using different power sources charging the batteries on the driving cars. Vivarail is now building a fleet of diesel/battery hybrids to operate the Wrexham-Bidston line for Transport for Wales, where the diesel generators will be used to charge the batteries rather than powering the train. The train’s green credentials depend on the UK boosting its capacity to produce hydrogen from low emission, renewable energy, or potentially natural gas paired with carbon capture and storage. The key question is: can it be competitive? Electrolysis production costs are connected to electricity prices, which have prevented widespread application thus far. Paradoxically, lower electricity prices would strengthen the case for total electrification of the network. I can’t help myself but everytime I read about Hydrogen fueled transport I get a Hindenburg twitch ! Please can someone with more knowledge than me explain the safety case for these trains and their tanks of Hydrogen fixed under passenger carriages ? Its an easy answer. First, the Hindenburg disaster was actually quite mild.Compare with an airliner fire). The deaths were mainly people falling. The heat went straight up. In a hydrocarbon fire (incl Natural Gas) , the dense gas remains around the ground. Hydrogen has been many times shown to go upward, for obvious reasons. Theres no comparison ! Hydrogen weighs a fraction of fossil fuel (about a fifth overall). The CEO of Toyota pointed out that a 40 tonne truck needed 8 tonnes of battery to drive 500 km. and even then, its running slow.